Don't forget to turn in your Summer Reading Records! Wednesday August 31st is the LAST day children and teens can turn in their summer reading records. Participants who turn in their summer reading records will get a prize bag full of lots of goodies including a voucher to send away for discounted Trailblazer tickets and a discount coupon to go to Oaks Park, good until September 4th. In addition, readers also get to pick out their very own book to keep. We still have a whole bunch of really great books up for graps, so bring your child or teen to the library today!!! Want a break from Raffi, Radio Disney, and Kidz Bop? 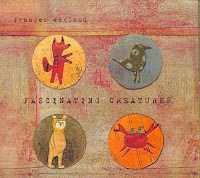 Try some of the up and coming (or actually already here) family music artists we have in our collection. I follow the Out With the Kids blog to keep up on the very latest "kindie" music. You might also want to read this article from Time just to see what the fuss is all about. As you're wrapping up Summer Reading and getting your family ready for school, don't forget to submit your entries (one for each child) to win savings accounts from the Oregon College Savings Plan. 15 lucky winners will receive $1000 accounts! Stop by the library to pick up a submission form if you haven't already, and make sure your submissions are postmarked by September 2. ...to get Summer Reading prizes. Your kiddos must turn in reading records by August 31 to get their bag of goodies and a free book. ....to enter the Oregon College Savings Plan drawing. You have until September 2 to mail in your entries for a chance to win a $10,000 College Savings Plan for each child that signed up for summer reading. We still have plenty of entries here at the Library. ...to enjoy the summer. Reserve a Cultural Pass and get free entry to the Children's Museum, Japanese Gardens and other great local attractions. Check here for more details. There's just one more week of story times and programs left before we take a quick break (we'll start up again when school starts). Kiddos have until August 31 to turn in their reading logs and get their prizes. Over 2200 kids and 600 teens signed up for the Summer Reading Program at the Tigard Library. That's excellent! 1. Our Book Club registrations start on Saturday, August 20. 2. September is the City of Tigard's 50th birthday (that's an important one!). You can bet we'll be celebrating. 3. Starting in September Tigard will be reading all together in our community reads program. The theme? Hint: All of our programs will be out of this world! Check back for details. Do you ever first pick up a book and immediately not like it, but decide to persevere and end up loving it? 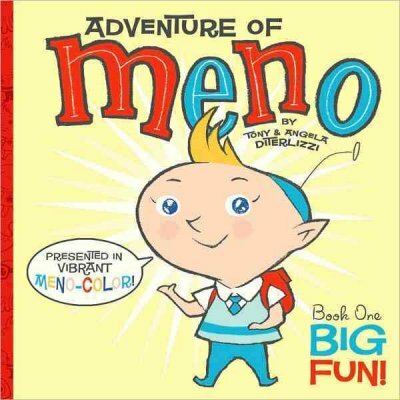 I found a series of picture books like that: Adventure of Meno, by Tony DiTerlizzi of Spiderwick fame. The cover of the book immediately caught my attention because it was so cute. I checked the book out and read it to my son. I just didn't get it. But for some reason, my son loved it. 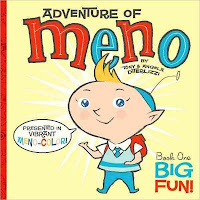 So I checked out a few more from the series, and I have to admit, Meno has grown on me, and now I look forward to reading them to my son. Meno and his friends, Yamagoo, Wishi and Zanzibar are always dealing with some kind of every day situation: Meno is sick, Yamagoo misses his friends, etc. My two favorites, Wet Friend and Uh Oh Sick! even include a couple of celebrities from my generation (I'll let you check them out to find out who). I think it's hilarious, and even though my son doesn't know these celebrities from Adam, he laughs as much as I do! I just read an interesting article about Young Adult literature and why adults should read it. It's interesting to me that the legitimacy of YA lit is still in question, considering the number of incredible, award-winning titles that have been published in the last several decades as the category becomes more popular. If you haven't explored YA lit yet, promise me you will. I read it for years before I became a teen librarian, and I know I'll be reading it for the rest of my life. While I enjoy a good adult book, there is nothing more refreshing than the sense of hope and discovery that can be found between the pages of a good YA book. Even the darkest genres convey a feeling of wonder and lack the cynicism of adult books, perhaps because these characters have their whole lives ahead of them. I've listed some recommendations below, and I welcome comments about your favorites. Teens are all about currency. In fact, their demographic sets many trends for the rest of us. Music, fashion, film, literature: It's all about what teens love and their tastes are constantly shifting. However, every once in a while there's a book that has a certain aura about it, and you can just tell that it will not only define a generation, it will be relatable to readers hundreds of years from now. Among these books is the Harry Potter series, and Sherman Alexie's incredible Absolutely True Diaries of a Part-Time Indian. OK, every reader is different, but to me, this book is perfect. This authentic, funny, deep, heart-felt, elegantly written book will go down in history as one of the greatest YA books ever written. And the audiobook (read by the author) is an incredible experience in its own right. The predominant trend in YA lit right is Dystopias. These books feature worlds that are often quite similar to our own, or portray a very clear vision of our future, and the protagonists endeavor to free themselves from the binds of a tyrannical government. What can be more typically teen than the struggle to find ones own individually and fight for independence in a world controlled by adults with their own agendas? I think we can all relate to that one. You've all heard of The Hunger Games, and if you loved it or are still waiting for your hold to come in, try one of these great reads: The Knife of Never Letting Go or Lauren Oliver's Delirium. Maybe you're a steampunk fan? If you love Jules Verne or contemporary writers like Paolo Bacigalupi or Cheri Priest, you may adore Scott Westerfeld's Leviathan or Eoin Colfer's Airman. Do you love reading stories about people like you, people that you could meet on the street or in the library? Me too. 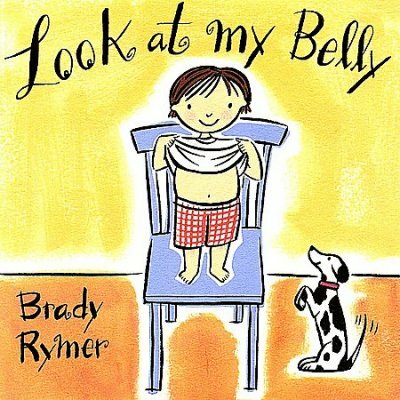 I love character-based books filled with revelations about what it means to be a friend, a child, a student, a human today. Books like Please Ignore Vera Dietz, Last Summer of the Death Warriors, The Canning Season, The Disreputable History of Frankie Landau-Banks and Love is the Higher Law. Lovers of history will not want to miss the fascinating, densely written and elaborately titled The Astonishing Live of Octavian Nothing, or the richly emotional Folly. Loved The Lovely Bones? Then try Stolen or The Missing Girl. Or, if you like your thrillers with a bit of a psycho-supernatural flavor a la Steven King (with a dash of Dexter), try I Am Not A Serial Killer. As you may know, there is a lot of fantasy in YA lit. A lot. You may think you're reading a mystery or a romance or some other genre, then find you are also reading a fantasy. There's a lot to chose from! Fans of Tolkien may love the books of Jonathan Stroud. If you like Miriam Zimmer Bradley, than don't miss Graceling. Terry Pratchett fans: if you haven't read Sir Terry's smart and hilarious Wee Free Men, you must. Hurry. Finally, if you like your fantasy modern, with a bit of steamy romance, try the fabulous Hold Me Closer, Necromancer. There are so many more great YA books. Stop by the Young Adult Reference desk sometime and we'll overwhelm you with even more recommendations! I know summer isn't over yet, but we're prepped for Fall programs, including our book clubs. Kids in grades 1-3 can join our Kids' Book Club, while those in grades 4-6 can be in the Super Readers. 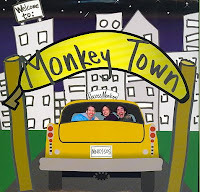 The Kids' Book Club is for kids reading at a 2nd to 3rd grade level. Each month the group will read a book nominated for the Beverly Cleary Children's Choice Award. At each meeting, kids talk about the books (including likes and dislikes) and enjoy some activities. Monthly meetings are on Tuesdays (usually the fourth of each month), 3:45-5 p.m. The Super Readers will be reading some new and old classics this year. The group usually meets the 3rd Tuesday of every month from 4-5 p.m. Kids chat about the books and enjoy some activities. Registration begins on Saturday, August 20 and is limited to the first 20 children for each group. Stop by the Children's Desk to register in person and pick up the first book. Stop by the Children's Desk to get some more information, including a list of dates and the books to be read. Thanks to the Friends of the Tigard Public Library, book club participants will get to keep their books. You little one wants to play on the computer. You'd prefer they do something educational. You can both get what you want with the TumbleBook Library, an online interactive picture book collection for kids. Your library card gives you access to all of the great stories, games and activities for kids. 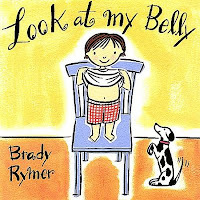 You can choose read-along titles for beginning readers or story books that simply read aloud a picture book. You can even create a playlist to make a mini-story time. I love that it includes non-fiction titles for those readers who love learning about "real" stuff. Leave a comment and let us know what you think.